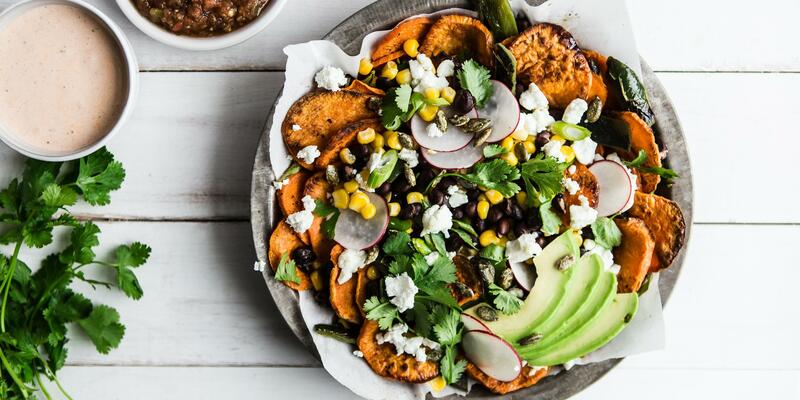 For a healthier take on nachos, sub the chips with roasted sliced sweet potatoes and load them up with flavorful, fiber-rich toppings, like beans and corn. "Since the sweet potatoes are less firm and crisp then chips, add toppings that provide a little texture, like sliced radishes and pumpkin seeds," says cookbook author Kristin Donnelly. 1. Preheat the oven to 425° and line 2 large baking sheets with parchment paper. In a large bowl, toss the sweet potatoes with 2 tablespoons of the olive oil and season with salt and pepper. Spread them out on the prepared baking sheets in as close to a single layer as possible, leaving room on one for the poblano. 2. 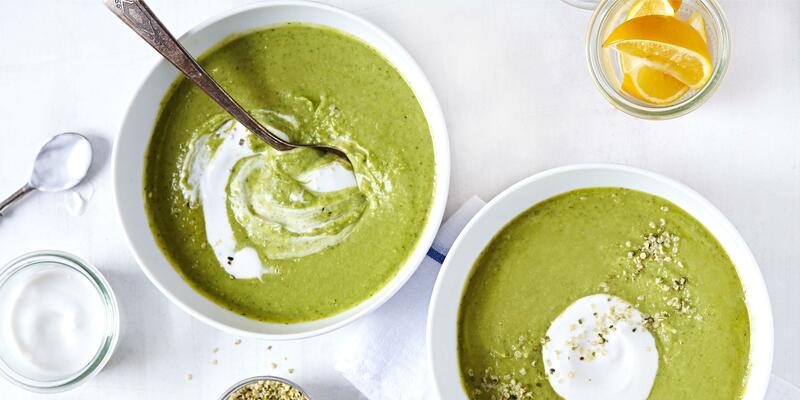 Rub the poblano with ½ teaspoon of the olive oil and arrange it on one of the baking sheets. 3. Roast the sweet potatoes for about 15 minutes, until the poblano skin starts to crinkle. Flip the poblano and rotate the position of the baking sheets. Roast for 10 to 15 minutes longer, until the sweet potatoes are tender and browned in spots and the poblano skin is very wrinkled. Transfer the poblano to a cutting board and let cool and set sweet potatoes aside on one baking sheet. 4. Reduce the oven temperature to 350°F. When the poblano is cool enough to handle, peel off the skin and remove the seeds. Tear it into strips and transfer to the large bowl. Add the black beans, corn, the white and light green parts of the scallions, 1 tablespoon of the lime juice, and 1 tablespoon of the olive oil to the bowl and toss. 5. Scatter the beans and corn on top of the sweet potatoes followed by the crumbled goat cheese. Bake the sweet potato nachos until the cheese is hot and soft, about 8 minutes. 6. Meanwhile, in a small bowl, mix the sour cream or yogurt with the adobo sauce, and 1 tablespoon lime juice. Add just enough water to make the crema thin enough to drizzle. To serve:Drizzle the crema over the nachos and garnish with the scallion greens. Scatter any toppings over the nachos as desired.